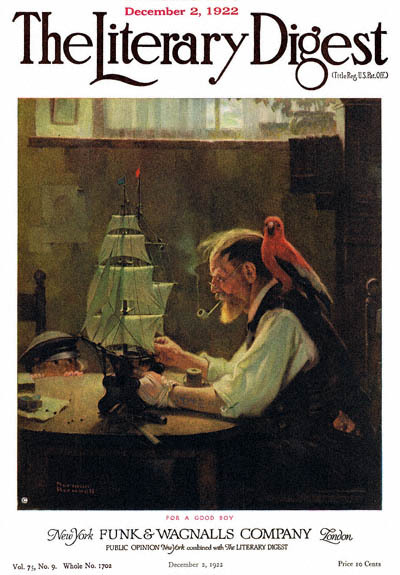 For a Good Boy, this Norman Rockwell painting, appeared on the cover of The Literary Digest published December 2, 1922. The alternate title for this painting is Sea Captain Building Ship Model. The title was given to the painting by the editors of The Literary Digest. This illustration was Rockwell's forty-second picture featured on the cover of The Literary Digest. From his first cover illustration in 1918, Boy Showing Off Badges to the last, The Night Before Christmas in 1923, Norman Rockwell artwork was published on The Literary Digest cover forty-seven times in all. The original oil on canvas painting, 29.5 x 24 inches or 75 x 61 cm, is part of a private collection. Rockwell used this cover to remind Literary Digest readers that Christmas was just around the corner. The title that the editors gave the painting reminds us that it is never too late to start being good. For a Good Boy was only one of 47 Norman Rockwell Literary Digest covers; here is the list of more Norman Rockwell Literary Digest scans. Norman Rockwell was the master of painting amusing situations. In this painting, we see a little boy peeking over the table at his father, the sea captain. The little boy is wearing the captain's hat. This is the little boy who must be good, at least until Christmas. Does this sound familiar? His father, the sea captain, complete with red and black parrot on his shoulder, is dutifully working to complete this Christmas present. And what a grand present for a boy whose father is a sea captain! His tools and supplies are all laid out on the kitchen table. In the painting, he is working on the sail rigging. He injured his left hand somewhere along the way, but keeps on building the model ship. He is enjoying a pipeful of tobacco while he works. We do not know whether Rockwell painted a real ship in miniature or if he commissioned a model to be made. Given Rockwell's penchant for realism, the bet is that he had the miniature built just for this painting.